With Shwmae Su’mae coming closer, we wish to ensure that this year’s Shwmae Su’mae day is the best yet. Its success depends on the commitment of individuals and organisations throughout Wales and we wish to invite you to arrange an activity and celebrate the day with us on october 15th. Shwmae Su’mae this year is on a Saturday for the first time. This gives an opportunity to include weekend activities on the playing field, leisure activities and on the high street. Education and other workplaces are encouraged to celebrate on Friday 14th October so that they do not miss a valuable opporunity to be part of the fun. Any type of activity is welcomed. Whether a small or big group. The main thing is to make a fun and inclusive opportunity. Running a business? How about offering a discount to customers who start their conversation with Shwmae or Su’mae? 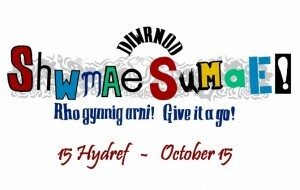 For information about activities throughout the country go to the website www.shwmae.cymru or followr Twitter @ShwmaeSumae. Use the hashtag #ShwmaeSumae to promote your event. The activity is promoted by Dathlu’r Gymraeg, but the day belongs to everyone. We want to hear about all the activities that are held and to raise national awareness. The Campaign Organiser for Dathlu’r Gymraeg, Elin Lenny, will keep a record of all the events. You can contact Elin by email shwmaeelin@gmail.com. This entry was posted in Digwyddiadau on Tuesday September 13th, 2016 by Golygydd.